As reported by The Guardian, an international multidisciplinary team led by Oxford archaeologist Dr. Eleanor Scerri has claimed that a comprehensive survey of fossil, archaeological and genetic evidence shows humans “mosaic-like across different populations spanning the entire African continent”. Thus, modern humans did not come from a specific area — namely East Africa, where the oldest confirmed Homo Sapiens fossils have been found — but are the end result of millennia of interbreeding and cultural exchange between semi-isolated groups. The telltale characteristics of a modern human – globular brain case, a chin, a more delicate brow and a small face – seem to first appear in different places at different times. Previously, this has either been explained as evidence of a single, large population trekking around the continent en masse or by dismissing certain fossils as side-branches of the modern human lineage that just happened to have developed certain anatomical similarities. The latest analysis suggests that this patchwork emergence of human traits can be explained by the existence of multiple populations that were periodically separated for millennia by rivers, deserts, forests and mountains before coming into contact again due to shifts in the climate. “These barriers created migration and contact opportunities for groups that may previously have been separated, and later fluctuation might have meant populations that mixed for a short while became isolated again,” said Scerri. The trend towards more sophisticated stone tools, jewellery and cooking implements also supports the theory, according to the paper in the journal Trends in Ecology & Evolution. Scerri assembled a multidisciplinary group to examine the archaeological, fossil, genetic and climate data together, with the aim of eliminating biases and assumptions. Previously, she said, scientific objectivity had been clouded by fierce competition between research groups each wanting their own discoveries to be given a prominent place on a linear evolutionary ladder leading to the present day. Disputes between rival teams working in South Africa and east Africa had become entrenched, she said. It is telling that all the Nobel Prizes this year — as in recent years — have thus far been awarded to multiple laureates, often of different nationalities and/or for research done in a country different from their birthplace. Like so much else nowadays, science is becoming an increasingly globalized endeavor, conducted across an international network of institutes, universities, labs, and other academic and scientific organizations. Of course, this is nothing new: almost every human achievement, regardless of time or place, can trace its origins to gradual, supplementary, or parallel developments elsewhere. Mathematical principles, political concepts, artistic expressions — all of the contributors to these and other fields built (and continue to build) upon the work of predecessors or contemporaries, adding to or refining the growing pool of ideas along the way. Thanks to advances in technology, expanding access to education of all levels (especially in the developing world), and a growing sense of global consciousness, this historical development is accelerating. Knowledge and talent know no boundaries, whether political, linguistic, or ethnic, and the more we facilitate the exchange of ideas and the collaboration, the closer we will come to greater human progress. This is not easy, due to both practical and cultural challenges, but neither is it utopian; there is thousands of years worth of cross-cultural progress persisting to this very day proving it can be done, and the world has a lot to show for it. Given how much more needs to be done — socially, scientifically, ideologically, etc. — we have all the more reasons to keep it up. “With almost every bone in the body represented multiple times, Homo naledi is already practically the best-known fossil member of our lineage”, Dr. Berger said. “It’s very, very fascinating”, said Ian Tattersall, an authority on human evolution at the American Museum of Natural History in New York, who was not involved in the research. “No question there’s at least one new species here”, he added, “but there may be debate over the Homo designation, though the species is quite different from anything else we have seen”. Learn more about this seminal finding from National Geographic, with which Berger is associated (apparently, he is quite a prominent and accomplished figure in his field). An often unreported part of almost any disaster response is the pivotal role played by the victims themselves. Whether directly impacted or not, citizens from all overall the affected country come together to help one another and recovery. Why Do People Do The Opposite Of What They Are Told? What is it about being told something, even politely or for good intentions, that makes us keen to do the opposite, at least on occasion? We all know about reverse psychology, which is perhaps one of the most mainstream and widely observed aspects of human behavior — but what makes us so stubborn about following advice or directions, whether from loved ones or authority figures? Business Insider highlights three research-backed factors that explain this interestingly widespread practice. When someone tells you not to think about something, your mind has a sneaky way of returning to that very thought. In a brilliant study led by psychologist Daniel Wegner, people were told not to think about a white bear. They spent the next 5 minutes thinking aloud, saying everything that came to mind, and ringing a bell if they spoke or thought of a white bear. They couldn’t escape the white bear: on average, it appeared in their thoughts every minute, and most people accidentally uttered “white bear” out loud once or twice. When the 5-minute suppression period was over, things got even worse: they thought about it more than twice as often as people who had been directly instructed to think about a white bear. When we try to suppress a thought, two things happen. The productive effect is that we consciously search for thoughts that don’t involve white bears. The counterproductive effect is that we unconsciously monitor for failures. In the back of our minds, we’re keeping an eye out for pale furry creatures in case they prove to be of the polar variety. Is this ethical? Some might say that in the case of a haircut, the (split) ends justify the means. When people are resistant to us or our ideas, and we have their best interests at heart, it’s acceptable to mislead them for their own good. Others would argue that a meaningful relationship allows, or even requires, transparency. If we can’t be honest with someone about our intentions, how much of a bond do we really have? Wherever you stand on this spectrum, my hope is that you’ll be more attuned to reverse psychology when it wanders into your interactions. I also you’ll prevent it from biasing your choices. Next time you find yourself opposing a recommendation or warning, it’s worth asking whether it’s genuinely a bad idea. Maybe you’re just trying to fight for your freedom or scratch an itch. Granted, like most aspects of human psychology and behavior, it takes a lot of continuous effort and conscientiousness to get the better of this habit. But the results — for both ourselves and those who are trying to help us — are well worth it. And needless to say, recognizing the motivations of our disobedience helps us better determine whether those who tell us what to do or not do mean well or are just trying to manipulate us. The Greatest Threat to the World? There seems to be no shortage of candidates for greatest threat to the world (by which we usually mean humanity specifically) — climate change, world war, nuclear weapons, a pandemic, an asteroid, or maybe even a combination of these factors. As it turns out, however, where you live determines what you consider to be most dangerous to the rest of the world. 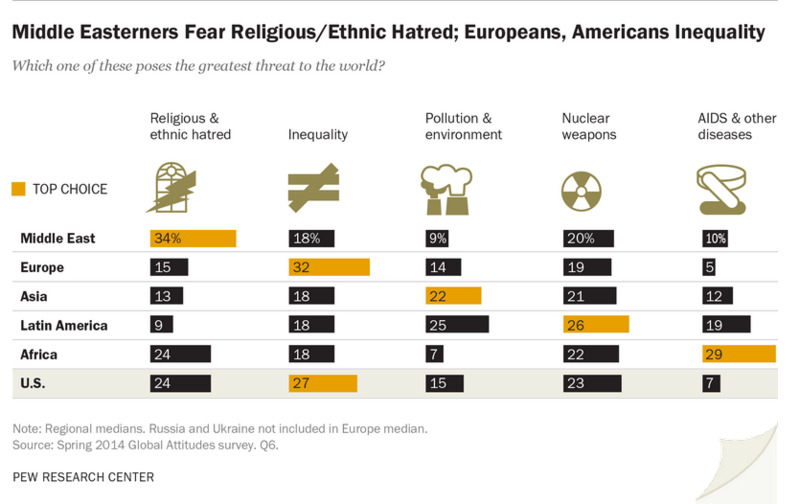 That is the conclusion of a recent survey by the Pew Research Center, which asked 48,643 respondents in 44 countries what is the greatest danger to the global community (note, this took place before the breakout of Ebola but after events like the Syrian Civil War and the showdown between the West and Russia over Ukraine). In the United States and Europe, income inequality came out on top. 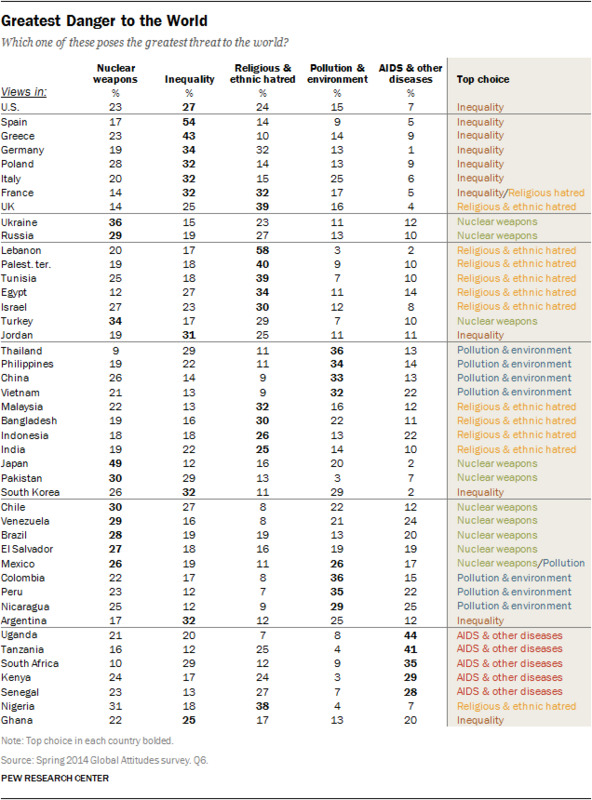 In the Middle East, religious and ethnic was considered the biggest threat. While Asia listed pollution and the environment, Latin America cited nuclear weapons, and Africa chose AIDS and other diseases. Unsurprisingly, the concerns fell largely within geographic and regional boundaries. The United States and Europe are home to some of the largest and most advanced economies in the world, so it’s somewhat expected — if ironic — that they’re worried about income inequality. Asia is home to 17 out of the 20 most polluted cities in the world, and, as of 2012, sub-Saharan Africa accounted for 70% of the world’s AIDS cases. Moreover, the perception that religious and ethnic hatred poses the greatest threat to the world has seen the most growth over the past seven years, no doubt due to numerous high-profile sectarian conflicts across the planet. Other than Japan, the countries that saw nuclear weapons as their biggest danger included Russia (29 percent), Ukraine (36 percent), Brazil (28 percent), and Turkey (34 percent). The U.K.’s greatest concern was religious and ethnic hatred (39 percent), putting it in the same group as India (25 percent), Israel (30 percent), the Palestinian territories (40 percent), Lebanon (58 percent), and Malaysia (32 percent). People in France were equally divided on what they consider the biggest threat, with 32 percent saying inequality and the same percentage saying religious and ethnic hatred. Likewise in Mexico, nuclear weapons and pollution were tied as most menacing, at 26 percent. These results are very telling: as the earlier excerpt noted, you can learn a lot about a country’s circumstances based on what its people fear the most. Reading backwards from the results, it makes sense that what nations find the most threatening is what they have been most imperiled by presently or historically. It is also interesting to note how societies, like individuals, view the world through their own experiential prism: because we are obviously most impacted and familiar with what immediately effects us, it makes sense that we would project those experiences beyond our vicinity. Just as our own individual beliefs — be they religious, political, social, etc. — are colored by personal life experiences, so too do entire nations often apply their most familiar concerns and struggles to the world at large. For my part, I personally put the most weight behind climate change, especially as it can exacerbate a lot of existing issues over the long-term (clashes among ethnic/religious groups over strained resources, refugees fleeing crop failures and placing strain upon host countries, etc.). What are your thoughts and opinions regarding the world’s greatest threat?